In the aftermath of the Christchurch tragedy, NIOT leader Patrice O'Neill reflected in a blog post that the attack in New Zealand is part of a traumatic pattern. Eleven Jewish worshippers were killed at the Tree of Life synagogue in Pittsburgh; Six people were killed in a Quebec mosque; Nine African Americans were shot to death during Bible study at Temple Emanuel in South Carolina; Six were killed before service at the Sikh Temple of Wisconsin, and in an equally deadly massacre, 49 people were slain in an attack on an LGBT nightclub in Florida. One of the goals of Not In Our Town is to stop hate crimes before they happen and with that in mind, we presented a list of actions communities can take to honor the victims of the Christchurch tragedy, reassure members of their own communities who might be feeling scared themselves, and generally work to build safer, more inclusive communities for all. We were heartened to hear from several NIOT groups around the country that they were taking actions on the list. Here are the action steps with some concrete examples of how they can be implemented. 1. Join with your community group/faith group or neighbors and reach out to your local Mosque or Islamic Center to offer support. Show up and stand with them to secure their service. Not In Our Town Bloomington-Normal wanted to show solidarity with the grieving local Muslim community, said Mike Matejka, chairman of the local movement to stop hatred, discrimination and bullying. "We decided to just put the word out to come and we were going to just stand outside and hold signs, and we were invited in to join the service," said Matejka. Mohammed Zaman said it was heartwarming to see support from so many non-Muslims. Read more at The Pantagraph. 2. Gather your community to remember those who were lost in New Zealand. 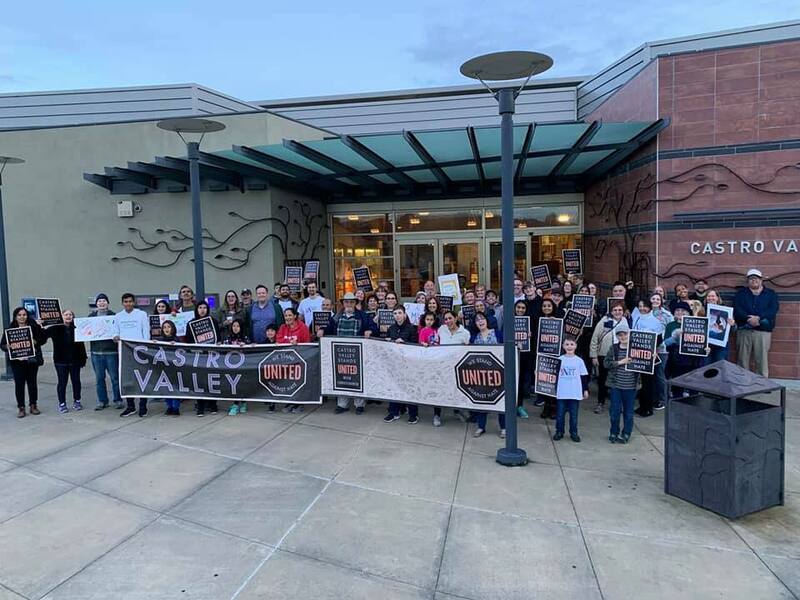 Castro Valley, CA Stands UNITED Against Hate, Castro Valley Stands UNITED With Christchurch. Before a community Unity Walk, residents signed a banner with messages of support that will be sent to the Mosque and the City of Christchurch. 3. Talk to your children, family and friends about anti-Muslim, anti-Semitic, racist and anti-immigrant messages they are seeing online and seek ways to overcome misinformation and hate. North Hempstead Town Supervisor Judi Bosworth recently donated books for children about diversity and inclusion to the local Little Free Library, located at the Port Washington, NY residence of Jeffrey Siegel. 4. Urge local leaders to meet with and show support for Muslim residents. 5. Ask law enforcement to increase security at Mosques. 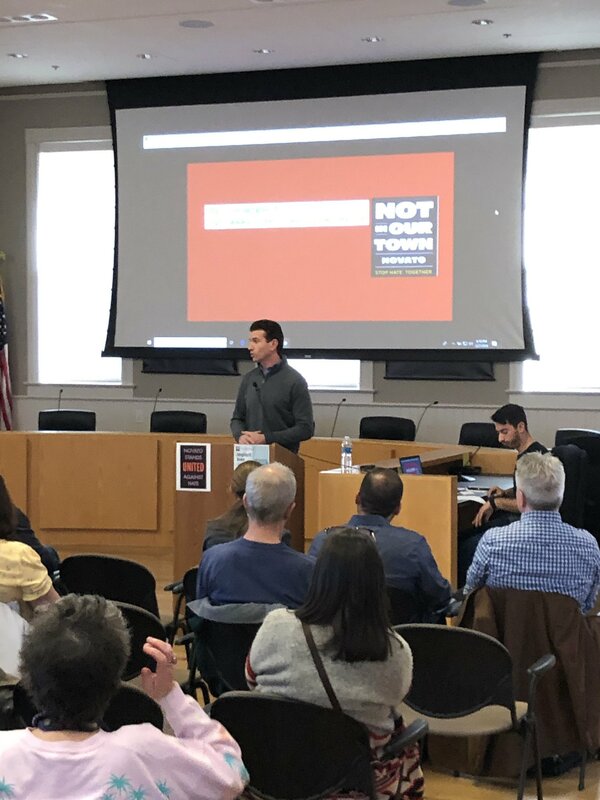 Local anti-intolerance organizations joined forces with law enforcement and educational institutions in Canton, MI as part of Canton-NIOT intiatives. Police Office Patty Esselink (left) builds relations between police officers and the community in her role as community relations officer. She's even organized a citizens' police academy that gives residents an up-close look at how police do their jobs. With her is resident Aamina Ahmed and Sgt. Dale Waltz from Canton Not In Our Town Committee. 6. Hold a teach-in about Islam. 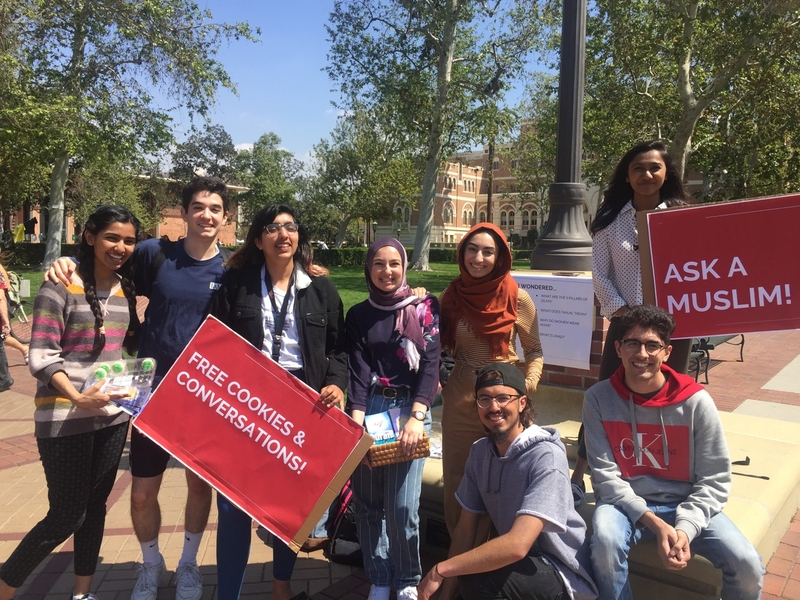 Members of the Muslim Student Union (MSU) held signs that read "Ask a Muslim" and "Free Cookies & Conversations" at USC on April 1, 2019 to encourage meaningful conversation. 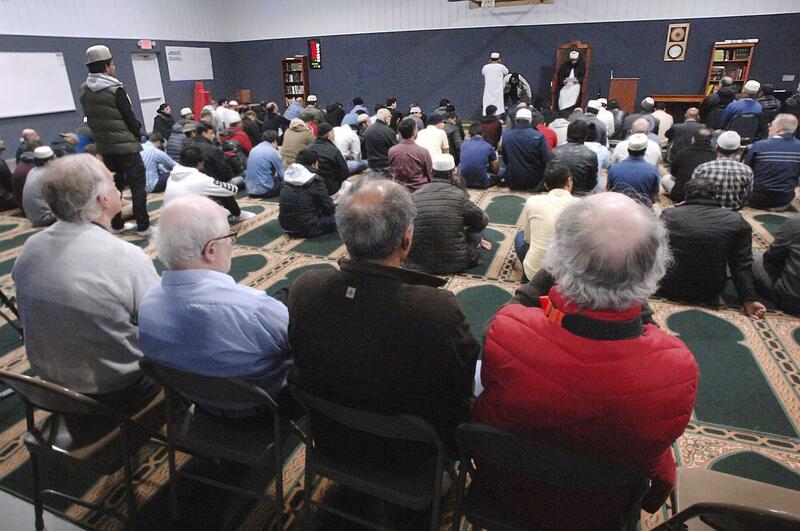 The event was a part of Islam Awareness Week, an annual initiative hosted by MSU. Read more at USC Annenberg Media. 7. 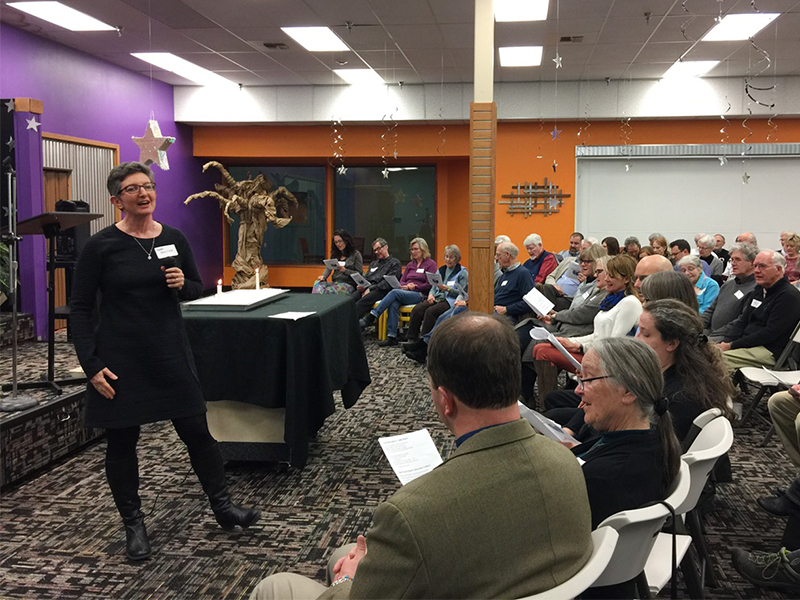 Host an interfaith event to show support for all who are targets of hate. 8. Contact local media to urge them to develop policies to monitor and counter hate speech. 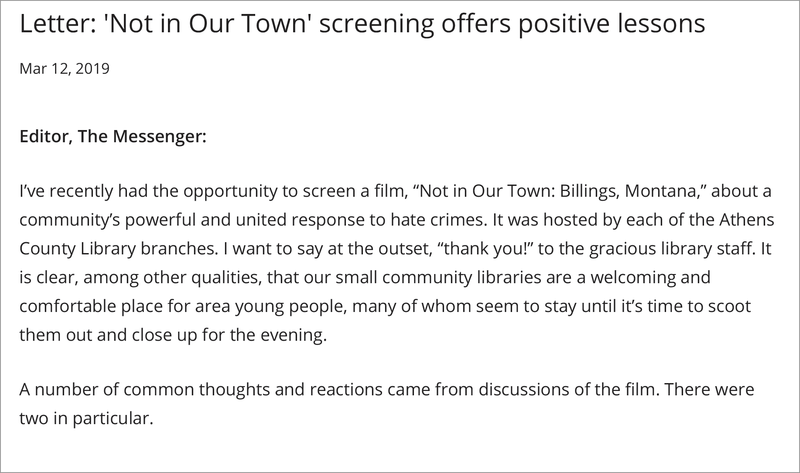 A resident of Athens, OH wrote a letter to the editor in the town paper after attending a Not In Our Town screening there, sharing what she'd learned and observed in the discussions afterward. Read more at The Messenger. 9. Don't feed the trolls: Don't escalate the divisive, hateful rhetoric spread in online posts. 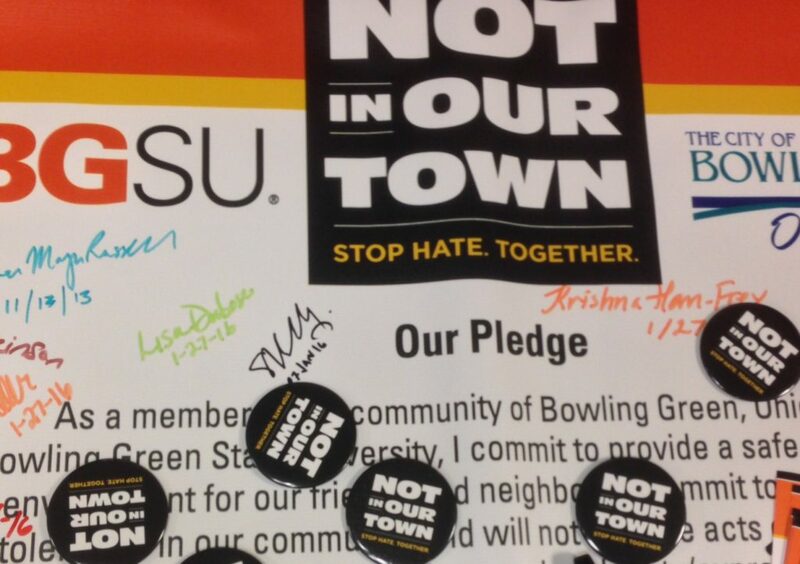 Members of the NIOT-Bowling Green group proudly display their signatures on the NIOT pledge. It's good to call out hate speech, but online we have to be smart about the way we speak out against hate. Don't fall prey to escalation from trolls looking to incite a reaction. Read more at the Guardian. 10. Share our NIOT Stop Hate Action Kits to respond to and prevent hate violence. 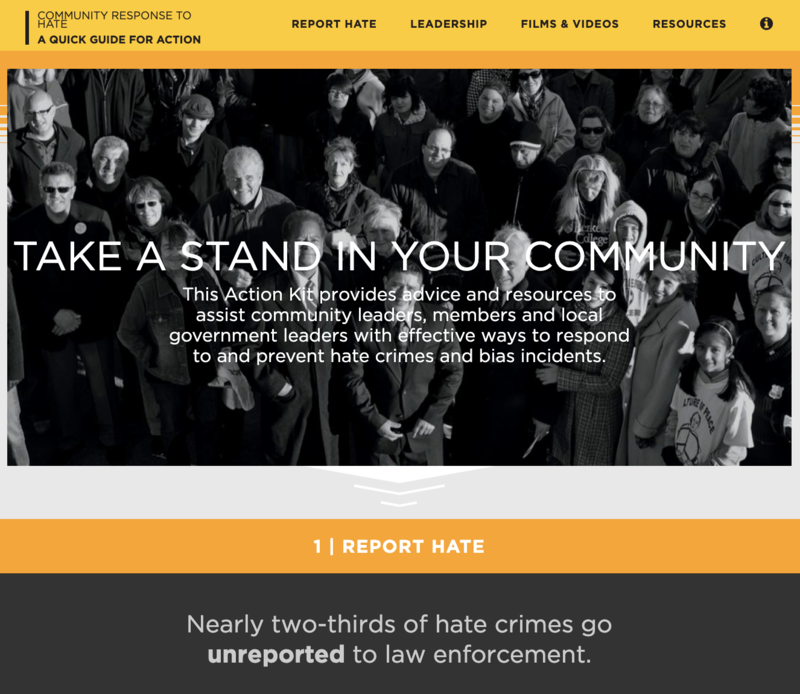 A screengrab of one of the four Stop Hate Action Kits we developed with the Lawyers Committe for Civil Rights in 2018. Download them. We can stop hate together, but it starts with us. Please share more news and photos of your local actions with us at info [at] niot.org!